I recently came across a painting in gouache of the second Key of Basil Valentine. This was sold at an auction held in France last year. It probably dates to the late 17th or early 18th centuries. It follows the 1618 engraving quite closely, though changing the format from landscape to portrait. On the back of the painting is the inscription "Dr. Joseph Maxwell Collection 1949". 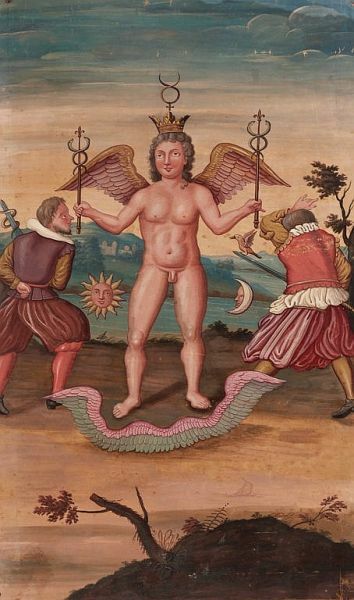 The auction catalogue entry states that Dr. Maxwell is known for his works and studies symbols, arcana and divination, however I have been unable to find any further information about him. There is also attached to the back a bookplate of Georges Flore and Genevieve Dubois, who are likely to have been the more recent owners than Dr. Maxwell.